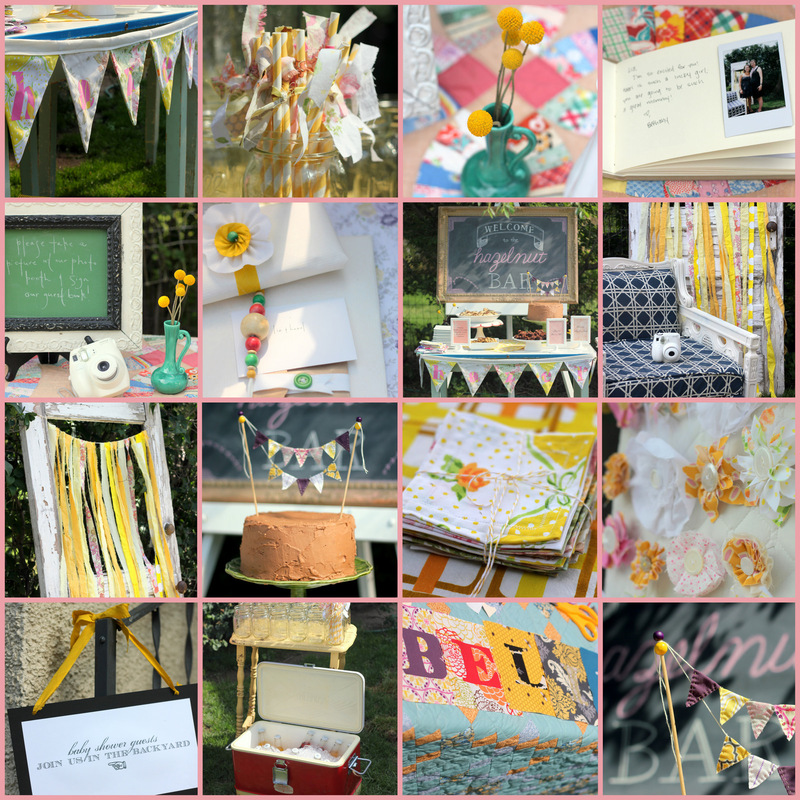 Y’all saw little glimpses of this vintage-fabulous baby shower last week. I am not exaggerating when I say that this is one of my favorite baby showers I’ve helped put together. Liz, the Guest of Honor, is a girl after my own heart. 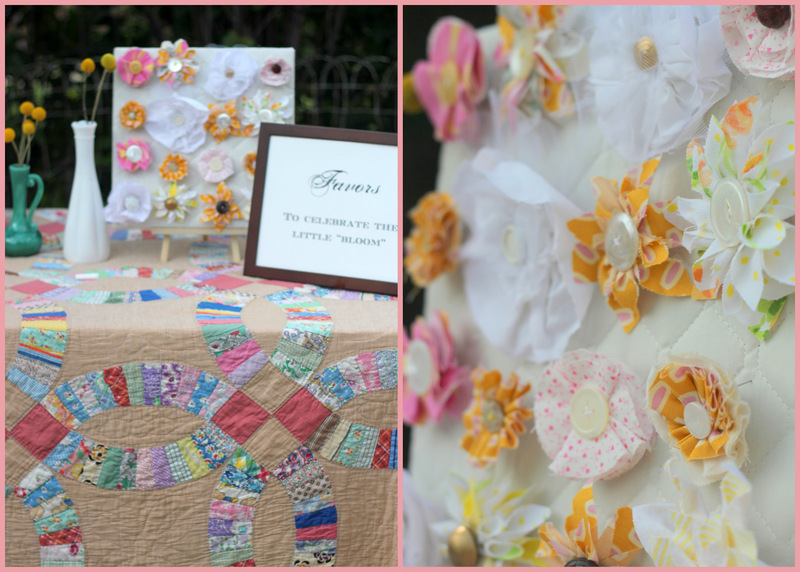 She sews, decorates, and repurposes like a champ- the perfect person to throw a retro, patchwork baby shower for! As a fabulous bonus, my four co-hostesses were lovely, crazy talented, and so much fun to ‘work’ with (that’s us above). 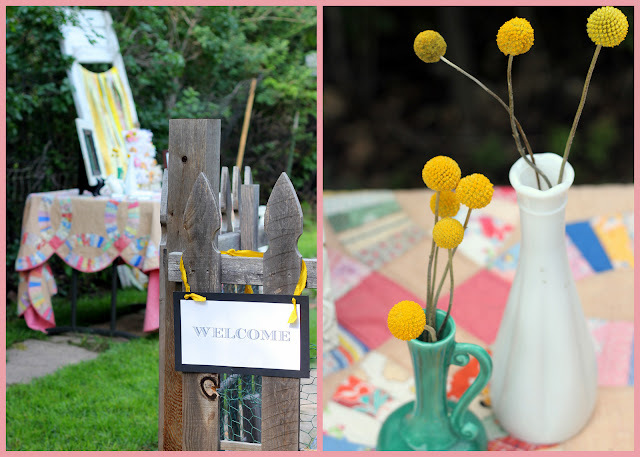 Since it was a garden shower, we sprinkled fresh flowers throughout the decor. 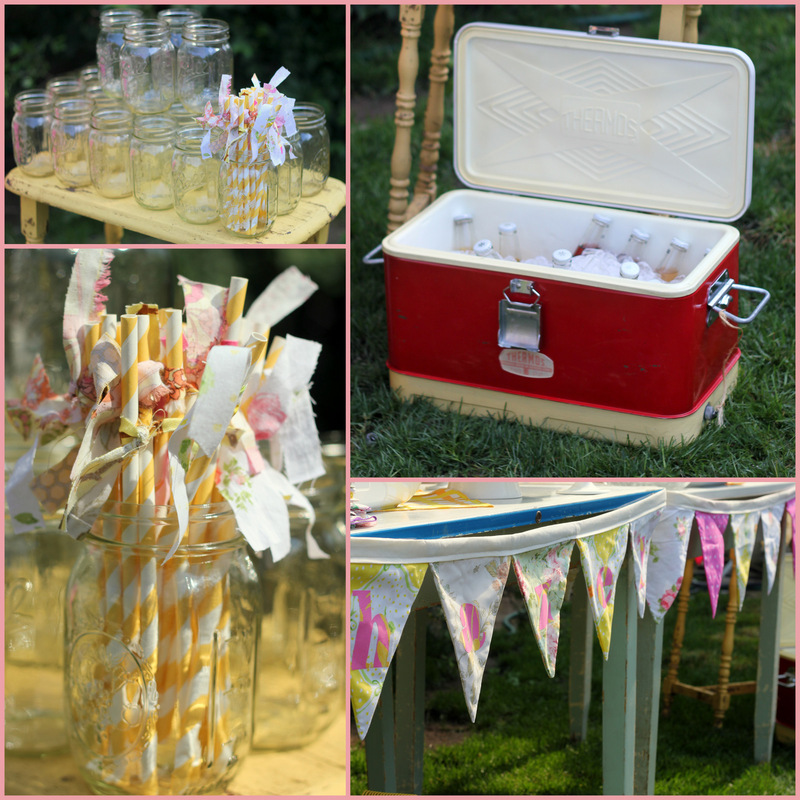 We also tried to incorporate as many retro elements as possible into the décor- a vintage cooler full of Izze’s, a sweet yellow table topped with mason jars and twisty straws, vintage quilts, an old door (as the backdrop for the picture taking), and retro servingware. We used vintage sheets for several of the décor elements (the bunting, the cocktail napkins) as well as for the favors. Baby Girl’s name will be Hazel, so of course, this baby shower needed a Hazelnut Bar. Brunch treats like hazelnut french toast and scones with hazelnut drizzle were accented with a sumptuous chocolate hazelnut cake, hazelnut brownie bites, hazelnut cookies, and a pitcher of iced hazelnut lattes. 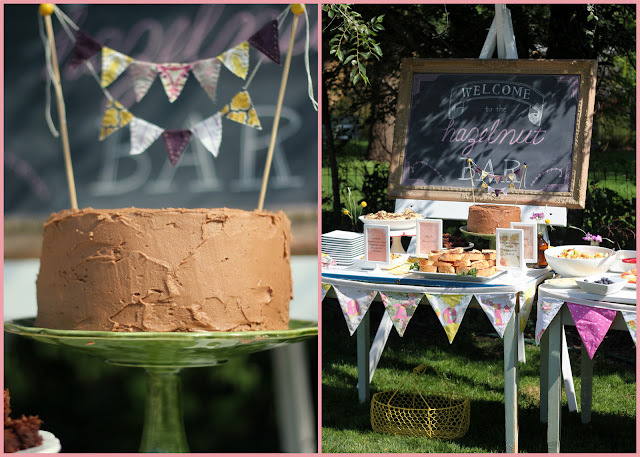 A vintage sheet bunting reading “Hazel” adorned the front of the table (and can be reused as nursery décor). Along with the Hazelnut Bar, there was a delicious brunch spread (egg casseroles, fresh fruit salad with mint, more Iced Lattes, orange juice, and a cheese tray). Yum! 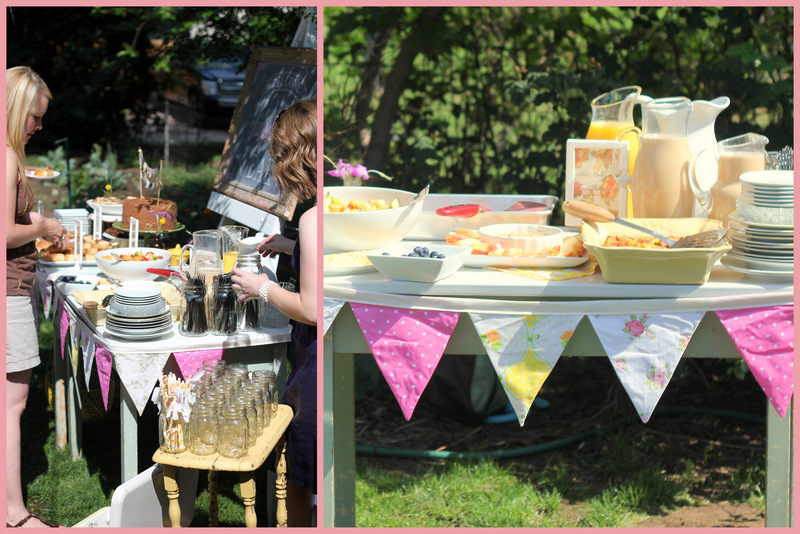 I love hostessing showers for crafty mama’s-to-be like Liz! She was wanting to make a quilt for Hazel, so we thought we’d help her in that quest. 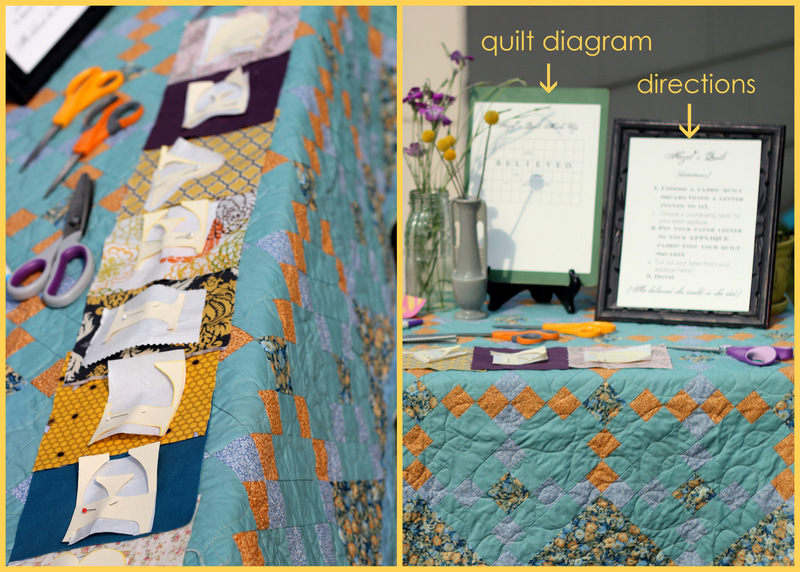 Since Liz also loves the quote “She believed she could so she did,” we combined the quote and the quilt into one great baby shower craft. To involve guests, we set out quilt squares and a quilt diagram and let the guests help add a part of the quote to a square. Liz was working on the quilt this week- I can’t wait to see the finished product! 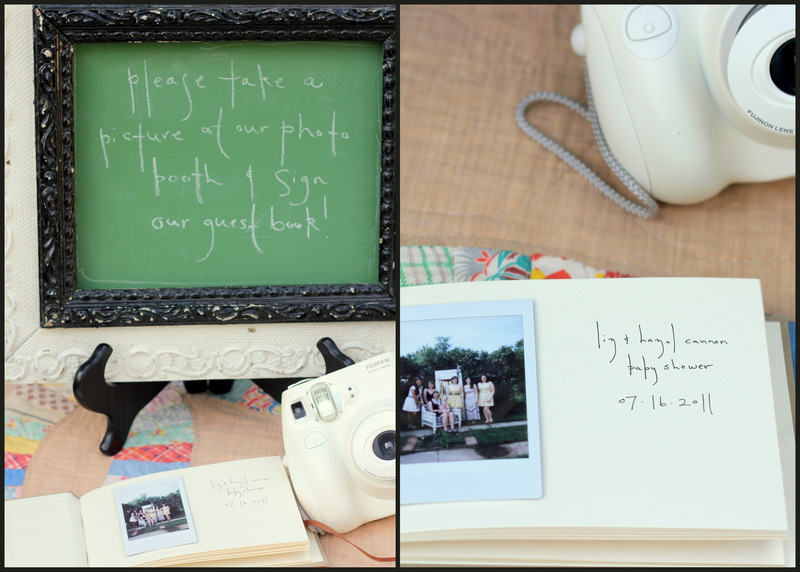 The photo guest book was a huge hit! We set out a polaroid camera and set up a picture backdrop. Guests took pictures with the Mama-To-Be and then added it (and a little note) to the guest book. The favors were fabric corsages made from vintage sheets. Each guest pinned on a vintage-y fabric flower to ‘celebrate the little bloom’ (if you’re looking for more fabric flower info, there are 49 other fabric flower tutorials here and a felt mum tutorial here). Like I said, one of my favorite showers to date… can’t wait to meet you Miss Hazel! Amazing job! Everything looks perfect!! I love all of the elements and the relaxed feel! oh my gosh, girl! love it all!! beautiful shower. This is so gorgeous! I am totally inspired! I just need to host a baby shower or wedding shower now so I can use these ideas!!! Beautiful!!! This is so adorable- I love all the vintage fabrics! I am sure she loved the shower. This shower is incredible Kirstin!! What a lucky momma to be! So much fun and so many beautiful pictures!! I'll be pinning this post like crazy! 🙂 You have done an incredible job with the details and I just love the theme. Perfect. WOW, WOW, WOW – that's one of my favorite showers ever too. Awesome job!!! kirst!!!! thank you thank you thank you. of course i knew your post would be awesome. can i be jealous of myself?? because I AM! I thank God for great friends (and worker-bees) for you all!!! Beautiful job. (everyone I talk to that has seen the pics say it looked so amazing). What a GORGEOUS party!! I absolutely adore it! 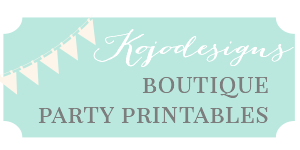 The theme for this baby shower is indeed so unique! I love combinations! Well, this is complete perfection. Oh, my goodness. I am drooling over it all. Love every single detail. What a lucky Momma! I can't imagine having a shower that amazing. Fabulous job, girls! WOWZA!! I love it, glad to be following this blog….you rock 🙂 Hope y'all are doing great! If we ever get prego I think this is it!!! LOVED IT! Another favorite Baby Shower. I love ALL of your ideas.